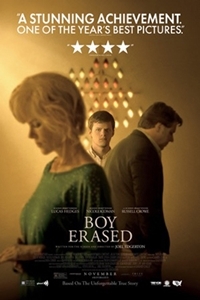 Description Boy Erased tells the story of Jared (Hedges), the son of a Baptist pastor in a small American town, who is outed to his parents (Kidman and Crowe) at age 19. Jared is faced with an ultimatum: attend a gay conversion therapy program - or be permanently exiled and shunned by his family, friends, and faith. Boy Erased is the true story of one young man's struggle to find himself while being forced to question every aspect of his identity.